“Exploring Elastic 3D Space: Bodies and Belonging” gives three years of project funding for our art project initiatives. April 4, 2016. Exploring Elastic 3D Spaces: Bodies and Belonging will develop a linked cycle of site-specific artworks that explore urgent global questions of migration, displacement, belonging and empathy, using the immersive potential of stereoscopic 3D (S3D) space. Merging old and new technologies in a custom-built, innovative way, and taking up stories embedded in public policies and places, the art works will use projections onto public structures and within gallery spaces to explore mythologies of belonging. Most broadly, the artworks consider how subjectivity, body and cognition are affected by engagement with 3D stereoscopic technologies. (Stereoscopy refers to a method of viewing or displaying stereographic images that creates or enhances the illusion of depth and volume. Despite its 150-year history and recent commercial revival, stereoscopy’s potential for creating fictional 3D worlds is just now being fully explored by artists, with those in the worldwide vanguard being the partners and collaborators, here). This SSHRC Partnership Development Project emerges from the on-going collaborations of 12 researchers in stereoscopic 3D virtual spaces, working across an international network. Over three years, researchers from Concordia University, the University of Québec à Montréal, Bath Spa University (UK), Emily Carr University of Art + Design (Canada), University of Sydney and University of Tasmania (Australia) will team up with Janro Holdings (Montreal home of the S3D drawing tool Sandde) and the Art Gallery of Greater Victoria. Together, this team of artist-researchers, working with researchers in the fields of Design Interaction, Computer Science and Performance Studies, will develop art projects based in archival fact, artistic fiction and personal stories of migration, investigating across partner sites the potential of 3D stereoscopic space in research-creation. 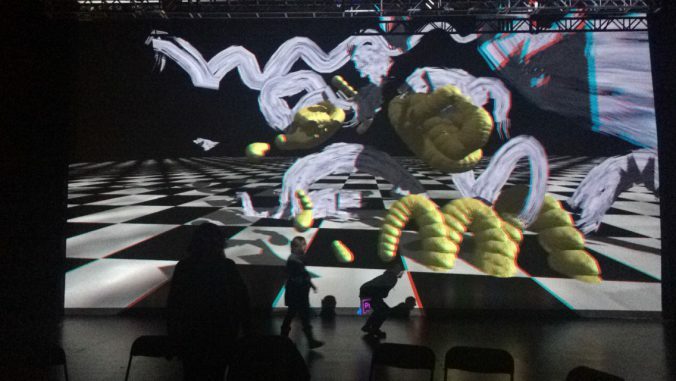 Partners will create artistic works spanning expanded media arts, expanded cinema and interaction, performance design, projection mapping and digital drawing. For instance, principal investigator Leila Sujir will create the Partnership’s lynchpin S3D artwork with partner institution, Bath Spa University’s School of Art (UK). Sujir’s Elastic City Spacey will be an immersive stereoscopic 3D projection for the exterior architectural space of the streets of Bath, inviting visitors to share space with the ghosts of history, to walk into the story. Similarly, with the Art Gallery of Greater Victoria, Sujir will create an interior projection where the viewer can immerse herself, move and interact, feeling through fully embodied engagement, the stories of past characters and the fantasies of future possibilities – with respect to localized, historical questions of place and belonging. The proposed 3-year research project builds on Sujir’s established research-creation practice, which in the last decade has evoked bodily-felt experience of displacement through stereoscopic 3D (S3D) spaces. These are dreamlike and ephemeral, yet capable of offering a sensation of volume, physicality, and presence to the viewer: they move as the viewer moves, giving a sense of space as ‘elastic.’ As conceived here, S3D elastic spaces are sites for viewers to explore other worlds: the virtual space becomes place – paradoxically, where one can experience displacement and empathy – in an innovative, evocative transformation not achieved in conventional virtual space paradigms. The partnership team’s innovative approach takes the investigation of virtual reality out of the more familiar electronic CAVE and into the public street and built environment, and further, proposes that the visitors not be seated/stationary but mobile – approaches that are currently of great industry interest. The partners and collaborators are guided by a shared an over-arching research focus: we explore how, in the future, when techniques such as 3D stereoscopy mean that everyone can see in a computer-enhanced way, our new sensory capabilities may affect people’s engagement with the places and people around them, our senses of belonging, connection and agency, our creative expression through art-making. Together, the partners aim to create 10 new projects (performative and publication) to be displayed and disseminated in 10 venues worldwide, reaching a wide gamut of audiences; develop ground-breaking new technologies for stereoscopic 3D creation; engage and train 8 student research assistants; and confer and brainstorm at a second-year Summit – developing professional relationships and creative technologies that will be the basis of further collaborations and partnerships.